Qart.com, founded in Los Angeles in 2006, is a unique art buying experience. In addition to its full online gallery, the firm features running auctions 24 hours a day, 7 days a week. Daily promotional listings come with $1 start bids, meaning nearly anyone can jump into the fine art buying game. Qart.com offers a variety of mainstream and commercially represented artists, as well as local and up-and-coming talent. It is the exclusive source for a wide array of licensed limited editions, as well as established “branded” art from names like Marvel Comics/Stan Lee, Disney, Peanuts, Warner Brothers and others. The artwork pictured here – an original acrylic on canvas painting by the German-born Pop Art icon Peter Max (b. 1937) – is a featured lot in Qart.com’s online auction ending Sunday, June 4th. 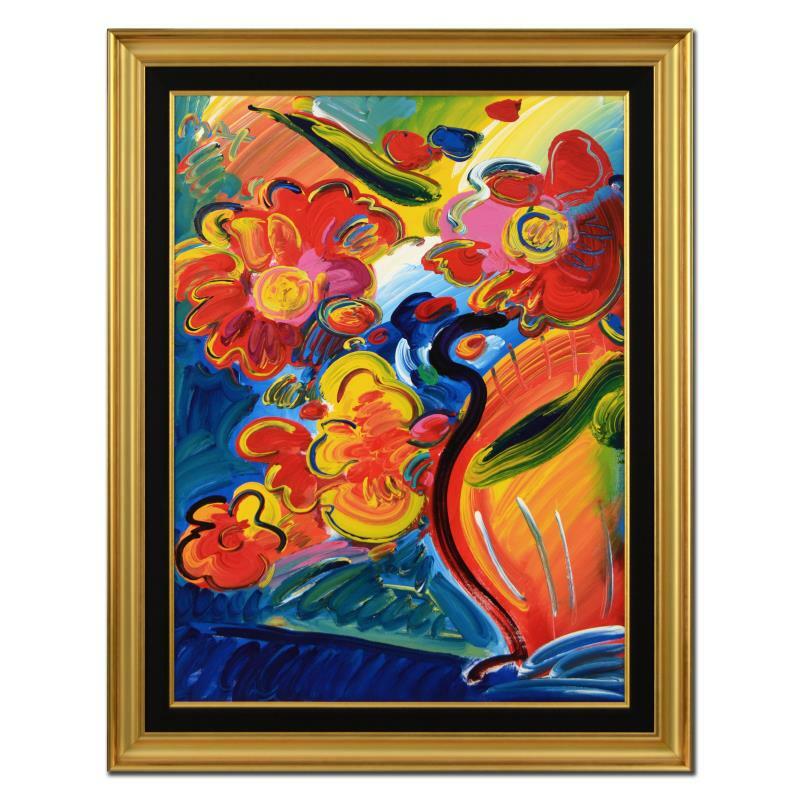 Titled Flowers, the painting is hand-signed by Max and comes with a certificate of authenticity from Peter Max Studios. The work is impressive, at 44 ½ inches by 56 ½ inches (in the custom frame), and carried an original retail price of $85,000. At press time, the high bid was just over $5,900. Now would be a great time to bid! 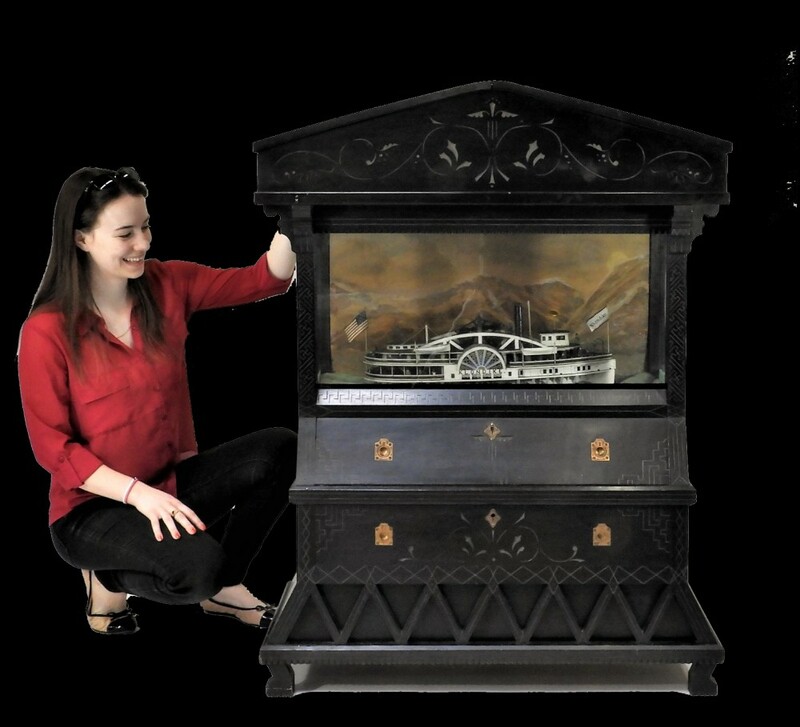 A masterfully made American folk art automaton of a steamboat side wheeler, crafted by prospector William “Billy” Briggs of Bristol, Rhode Island upon his return from the Klondike Gold Rush in Canada and completed around 1905, will be offered at public auction by Bruneau & Co. Auctioneers on Saturday, June 3rd, online and at the firm’s gallery in Cranston, R.I. The vessel, dubbed the Klondike, is 7 inches tall by 21 inches long and has a pre-sale estimate of $25,000-$35,000. It’s the expected headliner of the sale. The attention to detail is remarkable. Four lifeboats are strung around the top deck, two each on the port and starboard sides. The bridge is topped with a gilt carved full body eagle weathervane. Mechanical features that make it an automaton include the rotation of the starboard paddlewheel and vertical movement of the steam exhaust and supply pistons, activated by the movement of a drawer. The boat sits on a naturalistically modeled base. The diorama is housed in a custom Victorian Aesthetic ebonized display case. Abell Auction Company’s Quarterly Fine Art Sale, on Sunday, June 4th, will actually contain more than just fine art. The 552 lots will also feature fine jewelry (to include Rolex and IWC platinum watches), antique furniture (like a Neoclassical and gilt decorated polychrome console), two photographs from the esteemed photographer Louise Lawler (Am., b. 1947), and appointments. But the expected star lot is from the fine art category: the bright and colorful painting shown here, by Victor Vasarely, titled Tricomb. Victor Vasarely (1906-1997) was a Hungarian-French artist who’s widely regarded as the “grandfather” (and leader) of the op art movement. His work Zebra, from the 1930s, is one of the earliest examples of op art. 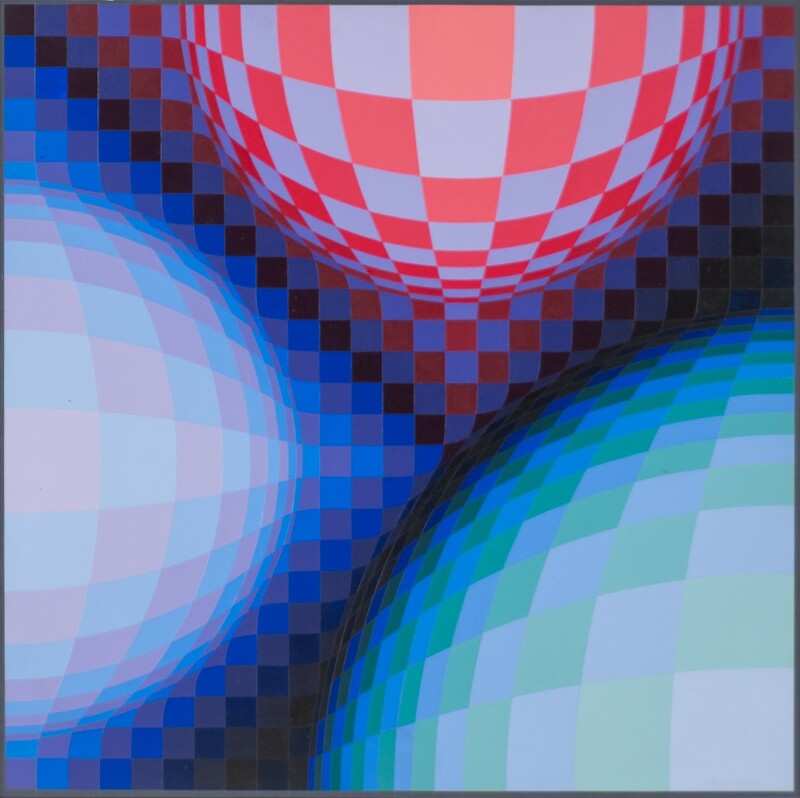 Vasarely’s innovations in color and optical illusion had a profound effect on contemporary art. Today his artworks are highly sought after by collectors. Tricomb has a conservative estimate of $25,000-$35,000. Also in the sale is a large artwork by street graffiti artist RETNA (Calif., b. 1979, real name: Marquis Lewis). Find out more and submit here to Abell Auction Co.
On Saturday, June 10th, Marion Antique Auctions will hold its 7th annual summer sale at the historic Marion Music Hall building in Marion, Mass. Featured will be the contents of the Fairhaven Colonial Club, which was formed over 100 years ago by a group of historic-minded residents – mostly women – many of who were descendants of whaling captains. The Fairhaven artist Lemuel D. Eldred suggested that they collect works by local artists and seek donations of local historical artifacts. Some of these will be in the auction. Sold will be paintings by renowned artists such as C.H. and R. Swain Gifford, William Bradford, Lemuel Eldred and others. Many of these were purchased directly from the artists or the artists’ families, and in some cases are accompanied by original bills of sale and cancelled checks. The three paintings by Bradford all come directly from his daughter, a member of the Club. 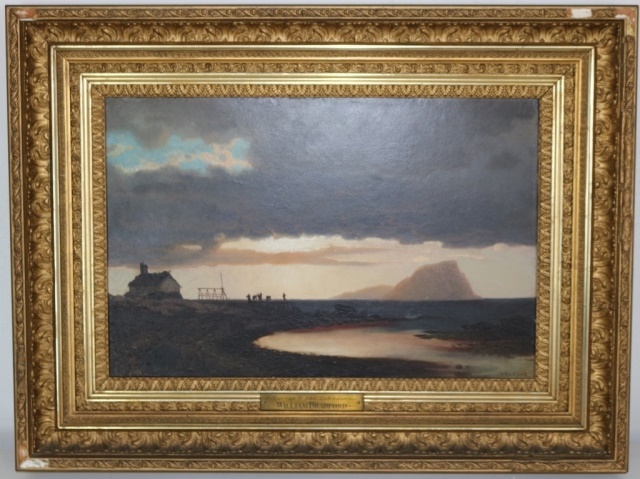 One is the work pictured here: an oil on board titled Near Cape St. John, Labrador, signed and in original untouched condition (est. $15,000-$25,000). The enormously popular Florida SuperCon will be held this year from July 27-30 at the Greater Ft. Lauderdale Convention Center in Ft. Lauderdale, Fla., and J. Sugarman Auctions (based in Hollywood, Fla.) will conduct the first-ever live comic book auction there. The auction – Friday and Saturday, July 28-29, from 6-9 pm Eastern time both evenings – will feature at least 7,500 comic books, including the inventory of Browse House Comics. The live auctions will be simulcast online both evenings. Further details are due soon. The auction will include key issues, bulk lots and graded comics. 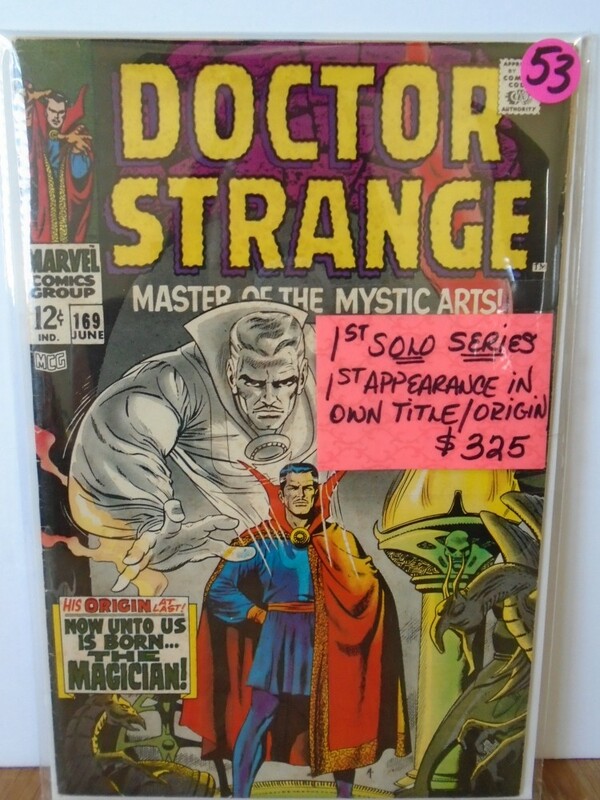 An example is the comic book shown here: Doctor Strange #169, in F++ condition. Prior to #169, the series was called Strange Tales. The solo series Doctor Strange was expanded to 20 pages per issue starting with #169, which ran for 15 issues (#169-#183, from June 1968-Nov. 1969). #169 is the first in the solo series with the first appearance in the title. Inventory lists and absentee forms will be available for attendees who can’t participate in the live event.